Will #GameOfThronesSeason8 see Jaime Lannister frame Tyrion for Cersei's death? 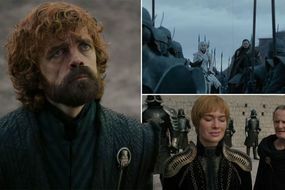 Game of Thrones viewers are gearing up to see a lot of conflict in the final season of the HBO epic. In the centre of many rivalries is Cersei Lannister (played by Lena Headey) - who has famously made many enemies in her time on the show. But she went against all odds in season seven when she finally lost the support of her twin brother Jaime Lannister (Nikolaj Coster-Waldau). He then ventured out of King’s Landing to find Tyrion Lannister (Peter Dinklage) - who is now supporting Daenerys Targaryen (Emilia Clarke), and Jon Snow (Kit Harington). Game of Thrones season 8 trailer 2: Is there a new GOT trailer? And it sounds like the duo are going to be reunited in the upcoming episodes, as Tyrion actor Peter has now spoken out about his scenes with Jaime. Jaime’s exit from the capital will most likely place him face-to-face with his brother, Tyrion, once again. The brothers last saw each other a few seasons back when Tyrion was being tried for the murder of his nephew, Joffrey Baratheon (Jack Gleeson). But Jaime was always the only member of the Lannister family who connected with Tyrion, and their relationship on screen has always shown this. Peter’s comment about the brothers’ “beautiful scenes” may be teasing the pair’s team-up once again in the final episodes.